I started my journey 6 months ago at the Mayhill Dental Surgery… Being a young 76 year old lady… After having a consultation and myself explaining what I would like to achieve I went ahead with the placement of 6 dental implants and fixed teeth. Now my treatment has been completed I am so pleased with the outcome I really do not know I have implants they look so lovely.. just wished I had done this long long ago. Why do teeth die on us? Teeth contain a blood supply and healthy teeth are very much alive. The pulp of the tooth extends from the crown to the roots. When the nerves in the pulp of the tooth become damaged either through injury or decay, they stop providing blood to the tooth. The nerve basically dies and your dentist would describe it as a “non-vital” tooth. Discoloration might be one of the first signs. A tooth that is dying will be different in colour to the rest of the teeth. It might be a dark yellow or light brown in colour. This will get worse over time as the nerve continuous to die off.Pain when biting or chewing could also be another symptom but not always. Some people don’t experience any pain and may be unaware that the tooth has died. Other signs may include swelling around the gum line, bad breath or bad taste. Oversensitivity in the affected tooth when you drink hot or cold beverages is also another sign in the early stages. Trauma or injury is one possible cause. For example falling over and hitting your mouth or getting hit in the mouth. A tooth can die instantly or slowly over several months or years. Any injury to your teeth should always be investigated by your dentist. Tooth decay when left untreated can also destroy the nerves in the teeth and the surrounding bone. Decay will eat away at the enamel and eventually reach the pulp. The infection cuts off the blood supply to the pulp. The symptoms are usually intense pain. Dead teeth should be treated as soon as possible to give them the best chance of survival otherwise the bacteria from the dead tooth can spread which can affect the bone and surrounding area. The treatment for dead teeth is either extraction or root canal therapy. This involves cleaning out the infection in the pulp (roots of the teeth) with small instruments and filing and sealing the roots to prevent further infection. In many cases a crown is recommended to protect the tooth as root filled teeth can become brittle over time. If crowning is not necessary tooth bleaching may be used to treat tooth discoloration to the affected teeth. Porcelain veneers are also another option to disguise the discoloration. It is not always possible to cure badly infected teeth. Referral can be made to specialist Endodontists who use microscopes and can deal with difficult roots. Failing that, extraction would be necessary. The tooth lost can be replaced with an implant, denture or bridge. Your dentist would be able to give you the best options. Cosmetic dentistry focuses primarily on the appearance of teeth usually expressed when smiling. Whilst dentists should always put dental health first, dramatic improvements can be made without resorting to excessive removal of tooth structure. Computer simulation and smile design allow the dentist and patient to rehearse treatment to obtain more predictable outcomes. The five treatments detailed below are the most popular and conservative options available. This involves bleaching your teeth to remove any discoloration or stains on the enamel of the teeth. There is a large choice of whitening procedures which includes in the dental chair, at home or a mixture of both, depending on preference and budget. Tooth whitening only works on natural tooth enamel so fillings, crowns or veneers will not change colour. This is a tooth coloured putty that can fix small chips or minor discolouration. It is moulded to fill holes or chips in the teeth. This is then set hard with ultra violet light. Bonding can last a few years before it needs to be replaced. This involves reshaping a patient’s tooth or teeth. This could involve altering the position, shape, width or length. This requires strong healthy teeth as it involves sanding or using a laser to achieve the new shape. Contouring is often used with bonding to fill in chips. These are made of porcelain shells and are placed over the front of the teeth. They are cemented on to each individual tooth, changing the colour and shape and providing a more permanent change than whitening or bonding. It is very popular with celebrities as its an easy way to gain the perfect smile. You do however need to remove a very thin layer of tooth enamel to bond the veneer. This is becoming a very popular option and is used to straighten teeth. Invisalign uses a series of virtually invisible custom made aligners to gradually straighten teeth without the need for metal wires or brackets. Each aligner is worn for about 2 weeks and should only be removed for eating , brushing and contact sports. If you are curious about whether any of these procedures might be suitable for you please feel free to contact the Mayhill on 01600 712020 or email info@themayhill.co.uk. We are always happy to answer any questions or concerns. It is tempting to ignore a small amount of blood when you brush your teeth. However, bleeding gums should not be ignored as it could be a sign of gum disease. Treating bleeding gums quickly can prevent serious damage to your teeth and gums later on. There are a number of reasons why gums may bleed during brushing. One of the most common causes is gingivitis, which is the first stage of gum disease. This is the stage where gums become inflamed due to bacteria and plaque build-up around the teeth and gums. More advanced stages of gum disease can also cause the gums to bleed. If you have any of the above symptoms book an appointment with your dentist. They will help you identify the problem and may recommend a professional clean or surgery depending on the severity of the problem. Severe cases would be referred to a periodontist who specialises in treating gum disease. This is the most important part to stopping gums bleeding and overall dental health. This would include brushing at least twice a day for 2 minutes each, flossing and interdental brushing once a dayand visiting the dentist regularly. A toothbrush with soft bristles can also help the gums heal. Focus on foods that give the body nutrients to include fresh fruit and vegetables and wholegrains. A diet full of sugary foods will increase the risk of increase the risk of gum disease as sugar is converted into acid which attack the teeth and gums. High stress levels can contribute to bleeding gums. Stress increases inflammation which makes gums bleed more readily. It also lowers your immune system so it takes your body longer to fight infections. Learn to say no to pressure when you feel overwhelmed. Gum disease can be contagious. Your risk of developing gum disease increases if your partner has a lot of bacteria in the mouth. Try not to share items that contact another person’s mouth such as toothbrushes, drinks and utensils. Eating a well balanced diet is not only important for our general health but also for our teeth. Limiting the in- take of sugary foods prevents obesity which is well publicised but also keeps our teeth healthy as well. Eating too many sugary snacks can lead to tooth decay which in turn can cause infection and tooth loss. Bacteria is present in all our mouths and feed on sugars in the food. The bacteria change the sugar into acids. These acids are strong enough to dissolve the protective enamel on your teeth which in turn can lead to cavities. Pain may be experienced if the enamel is worn away which exposes the sensitive inner layers of the teeth. Frequently snacking on sugary food and drinks throughout the day exposes your teeth to acid attacks frequently. Acidic foods and beverages also exacerbate the problem causing a double acid attack on the teeth. The important part of oral health is preventing enamel loss. Choosing nutritious snacks and limiting sugary intakes can protect your teeth from acid attack. Some sweets are worse for your teeth than others. Sticky, chewy foods stay on our teeth for longer, increasing the risk of enamel erosion. Choose drinks that are low in acid such as milk and water. Soft drinks, diet drinks and sports energy drinks are high in acid. Using straws also helps limit how much your teeth are exposed to the sugar and acid in the drink. Are you really giving your kids a treat if you give them these drinks? How often we snack can also have a major impact on our teeth. Nibbling sugary snacks often is harder on the teeth than a dessert after dinner. Every time you eat a sugary snack, even just a little at a time, the bacteria produce damaging acids in your mouth. Therefore there is greater opportunity for tooth decay to occur. It is therefore best to eat sugary foods after a meal instead of multiple times between meals. Avoid slowly nibbling or sipping sugary or acidic foods over a long period. This helps clean out the sugar and acid left from the food and beverages, reducing the chance of tooth decay. Avoid drinking sugary or acidic beverages before bed; the liquid can coat your teeth with sugar and acid and attack the enamel while you sleep. So when choosing snacks think of the frequency you consume them, how long they stay in your mouth and the texture. Look for snacks that are low in sugar and fat; avoid sugary drinks between meals and brush your teeth 30 minutes after eating. 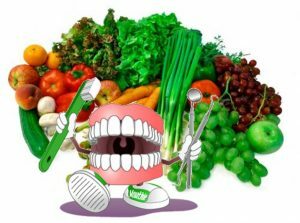 Choosing the right foods is not only good for your body and oral health, its also good for your teeth. For further advice please call the Mayhill Dental centre on 01600 712020 or email info@themayhill.co.uk . Tooth alignment can be improved at any age, so long as your gums and bone structure are healthy- so it’s never too late! Straight teeth can dramatically make a difference to one’s appearance but also improve oral health as straight teeth are easier to keep clean. Overly crowded teeth can get worse over time, and result in severely crooked teeth. Crowding can lead to plaque accumulation, tooth decay and increased chance of gum disease. Spacing issues and gaps between teeth can also lead to gum problems. We are also seeing more patients having difficulty with their “bite” or occlusion. This can lead to accelerated tooth wear, painful or clicking jaw joints. The latter can lead to headaches or even pain in the back or neck. A contemporary technique called Invisalign offers a discrete way of achieving straighter teeth without any visible evidence of braces. 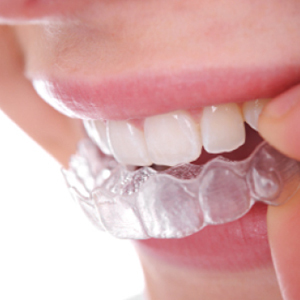 This system involves wearing a series of aligners which are custom made to fit securely over your teeth. They are made of smooth clear plastic, are removable and virtually invisible. With continuous research and development the Invisalign system has become more innovative, year on year, enabling even more complex tooth alignment cases to be treated and has considerably shortened the length of treatment time especially with teenagers who have had to deal with twin blocks to move the jaw prior to the start of wearing braces. Invisalign can now do this together with gently moving or rotating teeth at the same time. They also have the advantage for teenagers who play sport or a musical instrument as they are totally removable. During the initial consultation images and impressions of the teeth are taken and the Invisalign system uses advanced 3-D computer graphic technology (Clincheck) to predict the projected outcome of the treatment and show you what your teeth would look like at the end of treatment. Once treatment is started each set of aligners is worn for about 2 weeks, gradually moving the teeth towards their predicted final position. During treatment it is possible to eat and drink whatever you want as the aligners are removable. It is also easier to brush and floss normally to maintain healthy gums and teeth as there are no wires or metal brackets. With any orthodontic treatment retention is necessary to keep the teeth in the new position. Studies have shown that without retainers straightened teeth can gradually shift back to their initial position. Over 5 million people have used Invisalign so it’s a system that’s been well tried and tested.If you would like further information or advice on the above please feel free to call the Mayhill Dental & Specialist Centre on 01600 712020 or email info@themayhill.co.uk. Braces can cause food particles to get stuck in your teeth, wires and brackets. Rinsing after each meal will loosen food particles that might get stuck in the teeth and braces. A fluoride rinse before bed would be best after brushing. This will also help to prevent biofilm and gingivitis, a common problem when wearing braces. Ensure you use a soft bristled brush or power tooth brush for 2 minutes, the same as normal brushing. You may need to replace the toothbrush a lot sooner as braces tend to wear down the bristles faster. You can also use a special orthodontic brush which is smaller. This is a small brush that is helpful in cleaning between the teeth and can also be used to clean underneath and around the wire and braces. 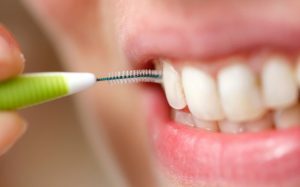 Regular and proper flossing is important to maintain dental health in general. Floss threaders can help you get under the brace and remove plaque that is difficult to reach. Make sure you see your regular dentist and hygienist every six months for a check-up and thorough clean. This will keep an eye on any areas that need extra attention. Hygienists can remove build-up of plaque in hard to reach places. Wear a Mouthguard if You Play Sports. They can protect your cheeks and lips from serious cuts and prevent damage to your braces if you fall over or get hit in the face. Eating sugary and starchy foods can cause plaque build up around the brackets, which can cause staining, cavities or gum disease. Avoid sticky, chewy foods which can be hard to remove from the braces. Hard foods such as nuts and crusty bread are discouraged as they can break or loosen the brackets. Cut crunchy food such as apples into small bite sized pieces. If you wish to avoid the above issues removable Aligners such as Invisalign are becoming very popular and worth considering. If you would like further advice please feel free to contact our friendly specialist Orthodontist Ben Cross who does children and adult orthodontics including Invisalign here at the Mayhill on 01600 712020 or email info@themayhill.co.uk. If the thought of going to the dentist causes your heart to race and your hands to sweat you are not alone. Although many will choose to make dental health one of their New Years resolutions, in reality many will give the dentist a miss due to dental anxiety. I know we have in the past written about dental phobias but I thought it was worth revisiting the topic as it is such a common theme with many patients who come to visit for the first time . The following account of a patient’s personal journey with us here at the Mayhill Dental Centre is very heart felt and thought it worth publishing in the hope that it will help other people overcome their anxiety. So do remember if you have a fear of the dentist you are not alone! Please feel free to call the Mayhill on 01600 712020 for further advice or help. I wanted to take the opportunity to write and thank you for your heroic efforts yesterday. 90 minutes working on a patient is taxing for all concerned (and I was just lying there). I really appreciated the kindness and professionalism of your staff – it makes such a difference when the nursing staff are not the usual faceless parade of anonymous agency personnel, and your team on the front desk are kind and courteous. The level of equipment in The Mayhill is second-to-none and I appreciated the skill you used in my treatment. I was further impressed that I had no pain or swelling even after such a long treatment and have returned to my normal work pattern today. Thank you again for your kind and professional treatment yesterday, it’s much appreciated.